"Alternately sad, sweet, funny, and heart-wrenching...a must read for fans of women's fiction." Michelle Sanderson is back on Blackberry Island after years in the Army. The Blackberry Island Inn was her home until a series of betrayals led her to join the Army to get away. Now, with the death of her mother, she is back to claim her inheritance and make the Inn home again. As if coping with the emotional and physical wounds sustained during her service weren't enough, Michelle comes home to find that her mother's poor financial management has placed the Inn in danger of foreclosure. Her only hope is meeting the bank's demands in order to buy time to turn the Inn around. Unfortunately, those demands included keeping Carly Williams on staff. Carly and Michelle were once best friends. They haven't spoken in years and don't want to start now. Carly and her daughter live at the Inn. The Inn is their home and the staff is their family. Carly has little savings and needs to keep her job but she knows Michelle is unlikely to want her around. For her part, Carly has missed her best friend and is willing to find a way to make this arrangement work. Can they get past the bitterness between them to save the Inn and each other? 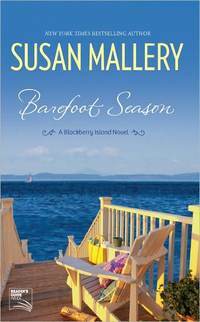 BAREFOOT SEASON is a bit of a departure from Susan Mallery's earlier works. While there are romantic subplots for Carly and Michelle, the heart of the story is the friendship between them. Michelle is the more volatile of the two as the effects of an injury to her leg and post-traumatic stress disorder cause her to lash out at those around her. Carly is dealing with the lingering effects of betrayals from a number of people she loved, most recently the lies told her by Michelle's mother. I was drawn in by their struggles which cause them to push away and pull together in ways that keep the tension high. Alternately sad, sweet, funny, and heart-wrenching, BAREFOOT SEASON is a must read for fans of women's fiction.